Before 2016, you can only talk to Siri through your iPhone or iPad. But with the introduction of macOS Sierra, Apple decided to finally allow Mac users the benefit of Siri’s assistance. Since then, Apple’s very own voice-controlled AI has been helping Mac users accomplish various tasks as their personal digital assistant. However, if you are a new Mac user, you might find that the Siri app is somewhat different from its iOS counterpart. So, in order to use and maximize Siri well, you need to know what it can and can’t do on a desktop or a laptop ecosystem. 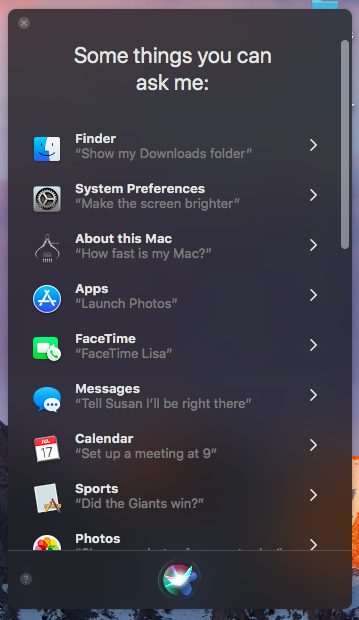 In this article, we’ll try to fill you in with info and tips on how to use Siri effectively on your Mac. What Siri Can’t Perform on Your Mac? Siri can’t close apps – We believe this is a precautionary measure to prevent instances of unsaved data or process interruption. Siri can only hear you clearly in quiet environments – Siri depends on voice commands, so if there’s a lot of noise in the area, she may not be able to catch your commands correctly. Siri isn’t your guy — or girl — for complex tasks – As we’ve tried to establish earlier, you must not expect Siri to do the thinking for you. You can’t leave her to do tasks such as editing photos or creating presentations. By the way, if there are some tasks you want to automate, you can try Mac’s Automator. You can’t also ask her to delete junk files and clean your Mac. You can use 3rd party cleaning tools like Outbyte MacRepair for that. Press and hold Command + Space for about two seconds. Note that if you don’t hold the keys long enough, you’ll activate Spotlight, not Siri. This is also the default keyboard shortcut for activating Siri. You can also customize the shortcut, and we’ll teach you how in a bit. If you have Apple headphones plugged into your Mac, press and hold the inline middle microphone button. Launch Spotlight, then search for Siri. Click the Siri icon in the menu bar (top-right of your Mac’s screen). Find Siri in the Applications folder and double-click on the icon. Go to System Preferences and look for Siri’s menu/options. Beside Keyboard Shortcut, select Customize. Press the keys you want for the shortcut. Make sure you don’t duplicate an existing shortcut. Close the window and you’re ready to go. Select the Dictation tab, then turn Dictation on. Choose the Microphone you’re using from the drop-down beside the Mic symbol. Change the language if needed. Select “Enable dictation keyword phrase”. Click on + to create a custom command. Make sure “While Using:” is set to “Any Application”. Beside “Perform:”, select Keyboard Shortcut, then key in the shortcut combo you previously created for Siri. You can now try launching Siri using the voice command you set. Note, however, that if you have Hey Siri activated on your iPhone, and you also use “Hey” on your Mac, both Siris could be woken up. So, consider using a different word on your Mac. 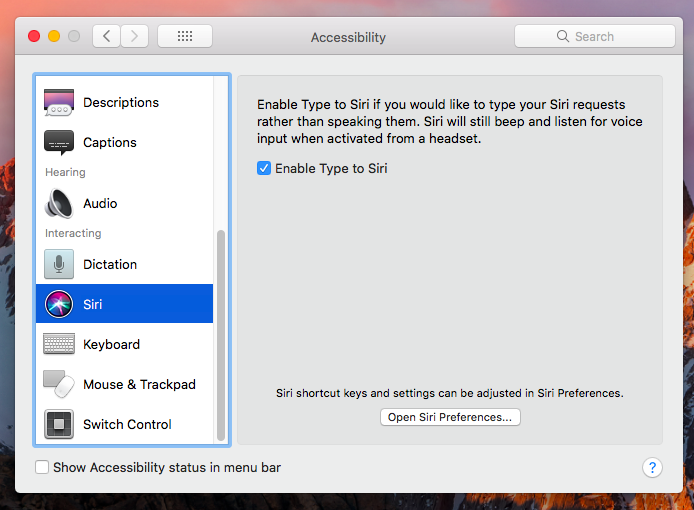 Open System Preferences > Accessibility > Siri. Tick “Enable Type to Siri”. This way, a keyboard will appear once you wake up Siri. By default, Siri will use Bing for her online search. But if you’re a Google fan, you can have her join you in this plight. While you can’t change the default search engine, you can tell Siri to “search with Google.” Next, she will likely ask back what it is that you want her to search for you. Unlike your iPhone, Mac doesn’t have a Clock app, so you can’t ask Siri to set an alarm or timer. But, you can tell her to remind you of certain things. For instance, you want to continue reading an email or webpage later, you can tell Siri to remind you of it at a later time. Simply activate Siri, then tell her something like, “remind me of this tomorrow.” This will prompt Siri to create a Reminder entry, with the link to the webpage or email. 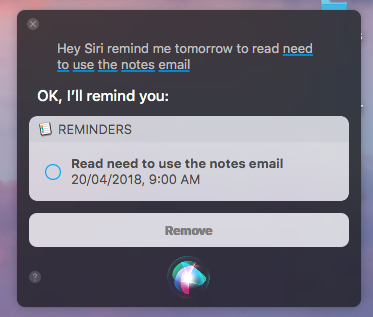 You may also ask Siri to remind you of items listed in the Reminders app, as well as birthdays and other occasions and events in your Calendar. Just navigate to the items and events and tell Siri to remind you of them. You may also use Siri in conjunction with Contacts. For instance, you can tell Siri to remind you to call John Peters at a certain time. Unfortunately, you can’t use Siri’s assistance for all apps. Siri will then ask you more details, including the date and time of the event or appointment. If it’s an all-day event, make sure to tell her that, too. Will it rain in (location) tomorrow? You can pin Siri’s search results to the Notification Center so you can see them whenever you open the Notification Center. To do this, simply click the + icon at the top right of the grey box where Siri’s result is shown. Since the query will be updated every time you ask Siri something, pinning a result will keep it in the Notification Center, allowing you to always see it and remind yourself of it. If pinning results in the Notification Center isn’t enough, you can screengrab and save them as an image instead. When you grab and drag the top bar of the search results box shown by Siri, the result will be turned into a PNG file, which you can drop to a Finder window, Microsoft Word, or another word processor. Show you files from a certain day or date. Play, pause or skip a song in iTunes. Send a message to someone. Enable and disable Do Not Disturb. Open Microsoft Word (or other related apps). Start an audio call with a contact. Search the App Store for certain apps. Show details about your Mac. Mute your speakers and adjust volumes. Enable and disable Wi-Fi and other network options, such as Bluetooth. Get sports scores, as well as team and player stats. You might be thinking that throughout this article we’ve been establishing how useful Siri can be, then why are we suggesting that you disable it? Well, there are several reasons why you would no longer want Siri’s assistance. For one, you might not like the idea that an artificial intelligence has access to practically anything that’s on your Mac and even beyond it. While Siri is a pretty secure tech, you can never be too sure when the next big cyberheist will happen and what apps and programs will be compromised. Open the Apple menu, then go to System Preferences. Click on the Siri icon. Un-check “Enable Siri”. Un-check “Show Siri in menu bar”. From activating to disabling Siri, we hope that this guide helps you get the most out of this Apple-exclusive feature. Got other Siri-related tips and tricks to share? Let us know in the comments! Next How to Add AirDrop to Your Dock?